The new age of Software-Defined Networks is upon us. Of them, open source projects through common platforms. OpenDaylight is an Open Source Software project under the Linux Foundation with the goal of furthering the adoption and innovation of Software Defined Networking (SDN) through the creation of a common industry supported platform. 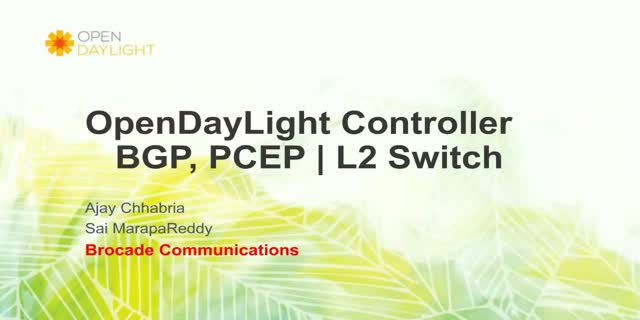 OpenDaylight Controller project contains more than 48 individual projects, out of which L2Switch & BGP LS PCEP are two important projects. BGP LS PCEP :- BGP LS PCEP project is an effort to bring two south-bound plugins into the controller: one for supporting BGP Linkstate Distribution as a source of L3 topology information, the other one to add support for Path Computation Element Protocol as a way to instantiate paths into the underlying network. L2switch project provides basic Layer2 switch functionalities. It also consists of reusable services (packet-handler, address tracker. flow writer) which further supports L2 switch functionalities. Join experts from Brocade and the OpenDaylight project to learn how software-defined networking has evolved, projects you can implement, and what to look out for in the future.